The following papal bulls, originally written in Medieval Latin, relating to Moycullen and Galway were issued in the years 1489, 1496, 1497 and 1501 respectively. They were included in James Hardiman’s appendix to O’ Flaherty’s Iar Chonnacht and were translated by P. J. Thullier of Belvedere College, Dublin especially for Cumann Staire Mhaigh Cuilinn. Papal bulls were official papal letters or documents, so called because of the use of a lead seal (bulla) showing the heads of the apostles, Peter and Paul. 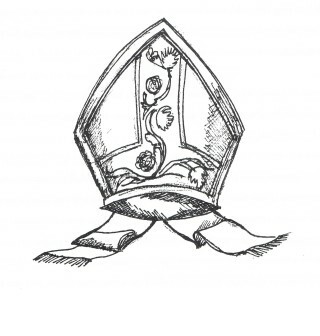 This seal was the official papal mark on the document. Prior to the fifteenth century, papal bulls were issued for all kinds of papal correspondence, regardless of importance. Later on they were reserved for very important communications such as the canonisation of saints. In 1814, a papal bull was issued to restore the Society of Jesus. Of the documents, the 1489, 1496 and 1497 are primarily concerned with Maurice O’ Flaherty, who set himself up as a cleric and availed of all privileges associated with clerics, much to the dissatisfaction of the Church. It appears that he was outside of the control of bishops and vicars. The 1501 document threatens excommunication on thieves who broke into the Church of St. Nicholas in Galway. Note the list of items damaged or stolen. the introduction, containing the inscriptio naming those to whom the document is directed and the salutatio or greeting to those people. the main content, containing the motive for the issue of the document, the promulgatio which gives legal purpose to the document and the narratio detailing the circumstances involved. the final orders, the document ends with the dispositio which instructs how issues are to be handled and what will happen if the said orders are not carried out. Excommunication was often threatened in this case. Finally the date and place of the issue of the document is given. This page was added on 24/02/2016.